I use Chrome across 4 different workstations and I have my extensions synced across all of them. The problem I have is that one of the extensions (Gestures for Chrome) works great if you've got an actual mouse, but on a trackpad on Ubuntu, it just gets in the way. If I disable it on the Ubuntu machine, it gets disabled on all Chrome installations due to its internal sync mechanism. Q: Can I selectively disable an extension on just a single machine? Based on the security concern, Chrome doesn't sync any extension which contains an NPAPI plugin. What is a NPAPI plugin? Code running in an NPAPI plugin has the full permissions of the current user and is not sandboxed or shielded from malicious input by Google Chrome in any way. You should be especially cautious when processing input from untrusted sources, such as when working with content scripts or XMLHttpRequest. 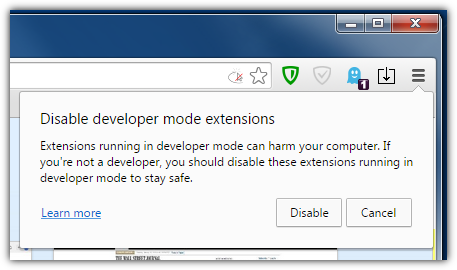 If we modify your extension in a way that Chrome recognize the extension using NPAPI, you should be fine. Second, go to the extensions folder that should not be synced. In your case Gestures for Chrome. Modify the background.html file of your extension you don't want to sync, also described on the Stackoverflow answer above. From here you are on your own. I don't know enough about extension coding. May be this is not what you are looking for but you can try this. Open the settings menu within Chrome by clicking on tri-line/wrench icon on right corner. Now open the Advanced sync settings..
Now select the option choose what to sync and then unmark the Extensions option. Now your extension will not sync with other PC's. You could install the extension you want as a Local extension. Find the ID of the Extension you want from chrome://extensions with developer mode enabled. Save it somewhere.. User Directory maybe? Return to chrome://extensions with developer mode enabled and press Load unpacked extension. And navigate to the new copy of the extension. You should see you have the extension twice now.. Disable the real one. I say Disable because there is a bad side to this approach and that is you lose automatic updates and you will need to repeat the above steps over and over again every time it updates. Then simply click on the extension that you don't want running and click "End Process". At work I have two computers and I don't want google hangouts popping up on both. The only bad thing is you have to do this every time you start up chrome. This is not to be a resolute answer, but another prospective to examine the problem. The Chrome sync system does not allow in any way, customizing the ratings by a single machine; And any solution with extra extensions that operates with the flag of disable/enable in your extention, will be fail! Because another machine that is simultaneously using the same user account, will reflect the change. A way to avoid this exchange of information is how well he proposed @avirk is disable the sync on extensions, but it seems that this solution is not appropriate for your environment. The other proposal is a little less conventional and could be considered a bad hack, but I will describe it in every way, so that you have a wider choice. Navigate to the folder of the plugin in question: .config/google-chrome/Default/Extensions/jpkfjicglakibpenojifdiepckckakgk/versionfolder and clears the contents into the file "background_page.html"
"This example can be applied only to the plugin: Gestures for Chrome (TM)"
This generates an exception when loading a page, that will not allow to the event code in your extension run correctly. So we will have the local disablement for this extension. Remember that any time you receive a new update for your extension,you must redo this operation in the new version folder. This is an rather old question, but still something that have been bugging me. So here is my own two cents. You might be able to use an another extension to do this. I myself have been switching between these two plugins: "Extensions Manager (aka Switcher)"
Handy extensions, applications & themes manager. Light popup manager to enable, disable, uninstall extensions, applications quickly and easy. A simple menu to enable, disable and access options of extensions. Another addition to the 'Simple' series. This time its an extension manager. I like both of the extensions, but haven't gotten to a point where I can say which one I like the most. Both of them are going through a lot of development and are updated frequently. Allow Google Chrome to perform the initial sync. After installation, go to the settings and disable extension sync. Remove the extension you wish. This basically keeps all the extensions in your user and you can manually edit them for each individual computer. Although I have to admit the previous answers were more interesting, this resolves your problem without much tech-savvyness. Another solution I've found is to use the policy mechanism included in Chrome. Google gives the possibility to manage extensions through group policies. By putting the unwanted extension on the blacklist we have effectively removed the sync for this PC. We can exploit this knowledge by setting these options manually. Create a new Key called "ExtensionInstallBlacklist"
By doing this the extension will be removed the next time you start your Chrome. This only affects the PC you are on. I checked this by having a clean install of Chrome. After logging in all extensions were loaded - especially the one we put on the blacklist on the other PC. Well probably an handy extension that list the installed extensions (https://github.com/rbrahul/chrome-extension-manager) and allows you to pick the one that you want to disable and keep that list on the browser storage would work. Yes it will disable globally but in another location the same extension will use a different list so enabling different extensions. Maybe instead of disabling killing the processes but I'm not sure it is even possible to do programmatically. Not the answer you're looking for? Browse other questions tagged google-chrome-extensions or ask your own question. Google Chrome: Have different settings on different computers? Can I enable an extension synced via Google only on some Chrome installs? How to disable Chrome's extension sync, only the “enable” part? How can I disable chrome extensions (when Chrome is unresponsive)? 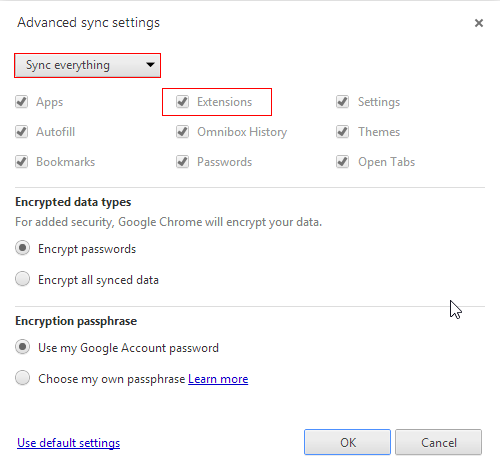 Google Chrome sync: Is there a limit for bookmarks & extensions? Understand structure of Chrome User Profile data to Transfer to new PC/ OS & avoid Settings corruption Error? How can I stop Chrome from syncing my extensions/apps every time?